← Don’t Buy a New Spring Wardrobe; Make Your Old Clothes New Again! While we all like getting new clothes, if you don’t take good care of the ones you’ve already got, you might find yourself wasting a lot of money replenishing your wardrobe. But if you follow some of the tips below and take proper care of your clothing, you can increase its lifespan considerably, saving yourself valuable time and money. Also, try to avoid the dryer if you can. Consistently drying your clothes wears them out and makes the colors fade much quicker than hang drying or sun drying. Not to mention, dryers use a lot of energy and put quite a dent on your electric bill. 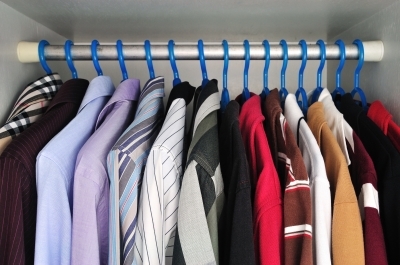 If your closet seems to be bursting at the seams, not only do you need another closet, but you’re also wearing out your clothes. When clothes are jammed together, they’re more apt to develop wrinkles and it will be harder to find things. Anything you worn that’s particularly expensive or fragile should be stored in its own garment bag or some kind of plastic covering for preservation purposes, even if there’s ample space in your closet. A little pre-emptive strategy is also important. Handling small problems immediately such as small tears or stains could save your clothes some serious hassle in the long run. Sew small tears right away and dab ice water or seltzer on food stains. Follow some of these tips and keep your clothing looking fresh for years. Also, if you have any great techniques that we didn’t mention, please share. We’re always happy to learn. This entry was posted in Closet, Fashion, Home, Organization, Storage, Wardrobe and tagged brad goreski, Closet, clothes, dry clean, dryer, rachel zoe, style, wardrobe. Bookmark the permalink.